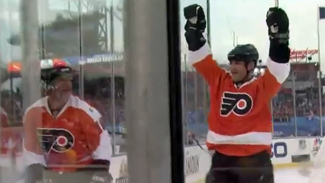 PHILADELPHIA -- For Bernie Parent, the Molson Canadian 2012 NHL Winter Classic Alumni Game wasn't just a chance for ex-players to lace up the skates one more time in an effort to recapture their glory for a brief, flickering moment. It was far more than that. To Parent, it was about family. "It was … I don't know how to describe this," said the Flyers' legendary goaltender, who was serenaded by the 45,808 fans at Citizens Bank Park with chants of "Ber-nie," during his four minutes on the ice. "I think the best way to describe it is the feeling you get when people chant your name, money can't buy. Any amount of money can't buy that. I look at it as one big family got together today. "It's not a team and people from Philly, it's one big family. And we enjoyed the whole thing as one big family." The Flyers defeated the Rangers 3-1 Saturday afternoon, but the game was about more than just who scored more goals. "Being in the locker room, for me, that's the most fun," said Flyers legend Bobby Clarke, who is now the team's senior vice president. Clarke, a three-time NHL MVP who won two Stanley Cups with the Flyers, said he will hold Saturday's festivities in the highest regard. "I think a game like this will rank way up there in what I consider important moments in my hockey life," he said. The warmth felt by Parent and Clarke for the alumni game was reflected in the show of affection from the fans toward Eric Lindros. During the pregame festivities, no one received a louder ovation than Lindros, who spent eight seasons with the Flyers before finishing his career with the Rangers, Maple Leafs and Stars. 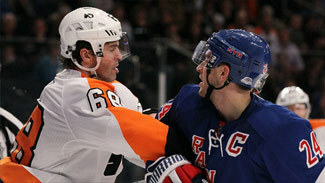 Lindros had an acrimonious split with the Flyers, one that left many fans angry when Lindros was traded to the Rangers. But he was welcomed back with open arms. "That was fun," Lindros said. "I had a good time. That was great. That was really nice to be back in town and to go out for that. That was real special." "I thought it was awesome," Parent said. "Let's face it, Eric should be remembered when he played his first three years, he was the best hockey player in the world before he got hurt. It was well-deserved." Defenseman Eric Desjardins played six seasons with Lindros and remembers how good a player he was. Saturday, the fans proved they remembered, too. "I think they always appreciated what he brought to the team," said Desjardins. "Today, to have him here and have him come out and have fans cheer what he did, I think they wanted to tell him they appreciated everything he did for this team." The 66-year-old Parent wasn't just a figurehead on the ice, there to take his cheers while some of the younger alumni played. He suited up to start the game and made six saves in his brief time on the ice, including a stop of Ron Duguay on a breakaway with an old-school, stand-up pad save. "That was great, just like the old days," Desjardins said. "Just stand-up. It was great for him to get a chance to get into right away." Lindros gave the fans a reason to get on their feet midway through the first period, when he displayed speed any 38-year-old would boast about it as he streaked down the right wing with Legion of Doom linemate John LeClair on a 2-on-1. Lindros hit LeClair with a perfect pass that led to the game's first goal. "He's fantastic," Lindros said. "It's like old times. He knows where to go and what to do. He's a talented player." Fan favorite Shjon Podein made it 2-0 with a rebound goal less than three minutes later. He had a chance for a two-goal game in the second period when he was awarded a penalty shot. But his backhand try against goaltender Dan Blackburn, who stole the show for the Rangers after taking over for John Vanbiesbrouck in the second period, missed the mark. Podein joked about that attempt that may have tipped off Blackburn before sailing over the net, saying, "Officially, I'm sticking with he got a piece of it." Still, Podein, who retired in 2003, put his goal in perspective. "I'll say it's my biggest goal of the last six years," he said. It's never the best feeling to be the visiting team in an alumni game, especially when it's in front of nearly 50,000 people who rooted against you throughout your career, but Vanbiesbrouck didn't mind suiting up for the Rangers instead of the Flyers. "The beginning part of it was like a roller-coaster ride," Vanbiesbrouck said. "You’re going up the first hill and you hear the 'chink-chink-chink-chink' going up and then, 'Woooo' all the way down. There is so much honor and respect between these two clubs. I had an opportunity to play for both and they are exceptional organizations." The Rangers only goal came off the stick of Glen Anderson, who deflected a shot past Neil Little during the second period. The Flyers' goaltending trio of Parent, Mark Laforest and Little combined to stop 33 of 34 shots. Hall of Famer Mark Howe provided the final highlight of the day, scoring on a penalty shot early in the third period. Even the lowlights brought laughs from the players. Lindros had a chance at a wide-open net, but missed it completely. "Yeah, I only missed it by four feet," Lindros said. "Maybe 15 years from now I'll try again." The crowd stood and cheered both teams at the final horn. As far as ways to ring in the New Year go, watching stars and rivals of the past take the ice together one last time is tough to beat. So were the expectations for this game, but Desjardins said that, somehow, it happened. "Oh yeah, and a lot more," Desjardins said. "To see the whole stadium full like that, it was as great experience. It was like being a kid again."